Mark KAboutData::setProgramIconName() as deprecated, it did not do anything. Use QApplication::setWindowIcon(QIcon::fromTheme("...")) instead. now follows the mime-apps spec, for better interoperability with gio when it comes to the user's preferred and default apps. new classes EmptyTrashJob and RestoreJob. new functions isClipboardDataCut and setClipboardDataCut. KActionCollection::setDefaultShortcuts now makes the shortcut active too, to simplify application code. The maximum worker count will now decrease if a lower value is set after workers have been created. Previously, workers would remain active once they have been created. Examples from the previous ThreadWeaverDemos Github repository are being merged into the KF5 ThreadWeaver repo. The maximum worker count can now be set to zero (the previous minimum was 1). Doing so will effectively halt processing in the queue. Documentation of various aspects of ThreadWeaver use is becoming part of the KDE Frameworks Cookbook. Parts of it is located in the examples/ directory. Support for relative libexec dir. the file dialog now remembers its size correctly, and works better with remote URLs. On Linux, using packages for your favorite distribution is the recommended way to get access to KDE Frameworks. Binary package distro install instructions. Building from source is possible using the basic cmake . ; make; make install commands. For a single Tier 1 framework, this is often the easiest solution. People interested in contributing to frameworks or tracking progress in development of the entire set are encouraged to use kdesrc-build. 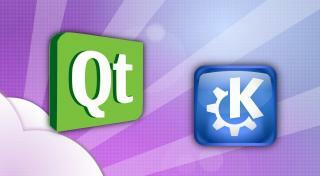 Frameworks 5.2.0 requires Qt 5.2. It is part of a series of planned monthly releases making improvements available to developers in a quick and predictable manner.